Plans for the creation of the Society were announced by the catholic bishops of the Church of England on 24 September 2010. It is not a membership society but is committed to mission and unity. The Society is supported and financed by Forward in Faith and administered by its Director. an association of Catholics and Evangelicals - female and male, young and old - seeking to renew the Church in the historic faith. Committed to the catholic faith as the Church of England received it, and to proclaiming it afresh in this generation. Upholding catholic order and the catholic doctrine of the sacraments, and in particular the threefold ministry in historic succession, which the Church of England shares with the Church throughout the world and across the ages. Longing for the visible unity of Christ's Church, and especially for communion between the Church of England and the rest of the Western Church. For these reasons, we are unable in conscience to accept the ordination of women to the priesthood and episcopate. 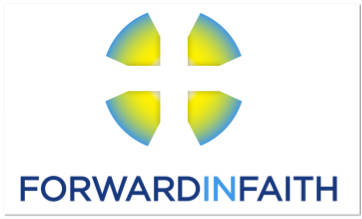 Forward in Faith is working, through the Society under the patronage of S. Wilfrid and S. Hilda, for an ecclesial structure with a ministry and sacraments in which we can have confidence, so that we can flourish within the Church of England and make our full contribution to its life and mission. This will be possible under the provisions of The House of Bishops’ Declaration on the Ministry of Bishops and Priests which will replace the Episcopal Ministry Act of Synod 1993 once the Legislation permitting women bishops is in force. Praying and caring for the sick, dying, departed and bereaved, the Guild of All Souls, founded in 1873, is one of the Catholic Societies of the Church of England, but is happy to welcome as members any who share its objects. For over 1000 years Walsingham, in North Norfolk, has been a place of pilgrimage, healing and renewal since 1061 when the lady of the Manor, Richeldis, had a vision of Our Lady, mother of Jesus and as a result built a replica of the house in Nazareth where Mary received the news from the Angel Gabriel that she was to be mother of Our Lord, Jesus Christ. Water from the ancient well within the Shrine church is used as a sign of God's healing. Our parish is only about 60 miles from 'England's Nazareth' and we regularly have pilgrimages to this holy place. An online journey through the churches of Suffolk. This website describes Mendlesham as: Suffolk's flagship rural Anglo-catholic church. Big, elegant and beautifully furnished. The county has no other church quite like it.